Months of hard work following the death of her mother have finally culminated in the grand opening of Pans ‘n Pancakes, Robbie Jordan’s new restaurant in South Lick, Indiana. The first day is a huge success; every table is packed with diners and some of the vintage and antique cookware Robbie has for sale has gone home with satisfied customers. But in the hours after Pans ‘n Pancakes closes after the grand opening, the assistant to the city’s mayor is murdered, found with one of Robbie’s signature biscuits stuffed in her mouth. Suddenly, all eyes are on Robbie – and not for table reservations. As if opening a new business isn’t enough, Robbie’s plate is filling up quickly: a budding romance, a possible arrest for murder, and new clues surfacing about the father Robbie never knew. As Robbie tries to focus on building her business and serving great food (which is wonderfully described by Maddie Day – my mouth was watering several times! ), someone in South Lick keeps her in their sights – literally. Robbie and her friends try to flush out the real killer before anyone else gets hurt, but she may already be too late. 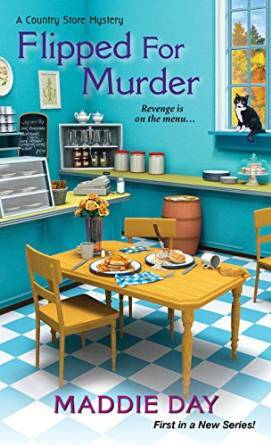 Flipped for Murder is the first in a new cozy series, one of the better debuts that I’ve read this year. Fresh characters, an original setting, and a refreshing voice all come together to create an interesting and puzzling mystery. While I don’t quite feel the chemistry between Robbie and her love interest, I thoroughly enjoy the characters Maddie Day has created and I look forward to getting to know them all better in future books. Click here to enter to win one of two print copies of Flipped for Murder! Flipped For Murder sounds like a great mystery, and I am looking forward to reading it. The cover art is delightful. Thank you for the giveaway. I agree, Jen. I loved the cover art! This sounds great and I am looking forward to anything written by Edith Maxwell. Thanks for the chance.